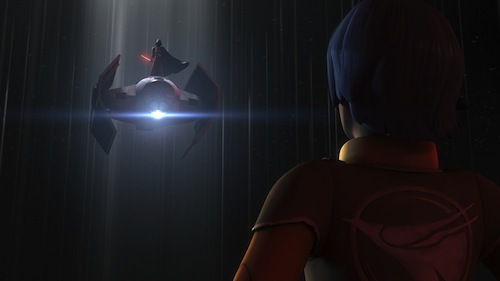 Star Wars Rebels takes a darker, more mature, turn in the breathtaking 1-hour season finale on Disney XD. Longtime fans finally get to see Darth Vader and Ahsoka Tano clash. It's a dazzling encounter between former master and apprentice that evokes all the feels. James Earl Jones reprises voiceover duties for Darth Vader and nothing more needs to be said. Series showrunner Dave Filoni and his creative cohorts aim high and deliver a dark denouement that will haunt many children's dreams much like the original trilogy did for the first generation of Star Wars fans (including myself). Whilst the season finale maybe unsuitable for younger children, the tone is in keeping with the darkness of The Empire Strikes Back and The Force Awakens. Clearly, Star Wars Rebels is being framed to tie-in very closely with Rogue One and A New Hope. Kanan and the crew of the Ghost may shape upcoming events in the original and sequel trilogies more profoundly than originally thought.